There are a number of medications, Ritalin and Concerta amongst others, that can assist children with concentration difficulties. But, can they improve handwriting and how would this work? Let’s take a look at whether this is true and if so, how it makes a difference. Handwriting is a complex skill that originates in the linguistic centres of the brain. We first need to decide what to write, following which the motor messages need to be sent to the hands to convert those thoughts into written language, through the medium of handwriting. The motor execution part of handwriting requires fine motor control along with all its sub-components that support good pencil control, as well as the so called “motor maps” for letter formation. So, in reality, the motor execution part of handwriting is a basket brimming with different components that need to be brought together in a a co-ordinated manner to produce handwriting. All these components are governed, overseen and brought together by one critical umbrella. This umbrella is concentration. It is often the job of us, as occupational therapists, to work on and develop all the components in the basket. But sometimes they just don’t come together to achieve our goal of the quick, legible handwriting that our children require. The reasons for this are diverse and complex, but there is a group where good handwriting is hampered by a lack of concentration. Concentration is the governor that oversees the amazing and complex skill of handwriting. If all the sub-skills in the basket are intact but concentration is not able to organise them and bring them together in a meaningful way, handwriting will remain poor. I have had the privilege of seeing children, who have worked for a lengthy period in occupational therapy on the foundational components of handwriting without significant success, miraculously improve their handwriting after starting on a medication to aid concentration. It is not because the medication itself improves the handwriting; it is because the medication improves concentration which allows the brain to bring those, already present, well-developed handwriting components together to achieve speedy and legible handwriting. I am not an advocate for concentration medications for every child. I am also not an advocate for concentration medications for every child with untidy handwriting. I am just using this opportunity to explain why, in some cases, handwriting can improve when children use concentration assisting medications. It is because concentration enables all those handwriting components that were already there to be brought together in a meaningful way. 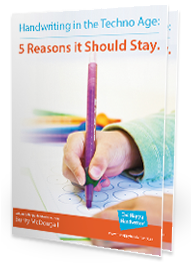 But, for the greater percentage of children with handwriting challenges, one should work on the motor components required through targeted activities, and focus on developing good letter formation. Without those in the basket, even good concentration cannot produce automatic handwriting with the speed and quality our children need to function optimally in the classroom. Download your free copy of Can Ritalin Improve Handwriting? | Thoughts from an Occupational Therapist here.